Pete woke up, feeling refreshed and was in a mood for a hot cup of tea. He got out of bed and went downstairs to the kitchen and helped himself- he knew where everything was, since he was one of the frequent houseguests. He figured that John and Yoko must have stayed up later and are sleeping, so he decided not to go and wake them up. Pete decided to occupy his time by reading the newspaper while he drank his tea, so he went outside to get the morning paper with his tea and settled himself in the library. After a few minutes, Pete decided to call Beth to let her know that he would be home by the afternoon. After their conversation, Pete continued reading his paper, it was nine-thirty AM. John woke up, at first, he was confused of where he was, and after realizing a few recognizable items, he realized that he was in the guest room... but why wasn't he in his own room? Next to him, a stir happened. John, who's back was facing the unknown, thought, Did Cynthia came home and we decided to go at it in the guest room? He felt a bit calm, because there was one or two occasions that he and Cyn did do their love making in the guest room before. He smiled and decided to grab Cynthia into his arms, but saw Yoko instead! Wait a min... his eyes wandered around the room and landed on the camera that was placed on the dresser. The events from the night before and early this morning came to his mind and also reminded him that he was in love with Yoko. He looked at Yoko again, his heart was pounding - the woman that he loves was sleeping like an angel. He went back down on the bed and put his arms around Yoko, and just stared at her with a smile on his face. Yoko continued sleeping. "Good morning!" John chimed, "Why don't you join me in the kitchen?" "Sure, there's some more tea in the kettle on the stove, it should still be warm," said Pete, walking with John into the kitchen. John took out a cup from the cupboard while Pete sat down on the stool of the kitchen table. After John poured himself some tea and then joined Pete at the table, sitting on another stool. "So, what time did Yoko leave?" asked Pete. "Oh, Yoko didn't leave, she's still here," said John. "Oh?" Pete's eyebrows rose, "What happened?" "We hit it off right away, made some music and then crashed," said John, with a smile. "Really? That must've been fun," said Pete. "Oh yeah. And Pete, I want you to do something for me, help me find a house for me and Yoko, I want to be with her, I'm in love with her," said John. "What?" asked Pete "But you already have a house." "Okay, okay, John, I'll look into it. But I have to go soon, I'm meeting Beth and my son, Matthew, at the shops this noon, so I better get ready," said Pete, getting up. He put his empty cup in the sink and went upstairs. Pete went to his room and got ready. He packed his pajamas and decided that it was time to go. London was minutes away and he wanted to beat the traffic. After saying goodbye to John, Pete left. An hour later, Yoko got up. What am I doing here? She thought, looking around unfamiliar settings around her, then she remembered, she spent an evening with John Lennon. 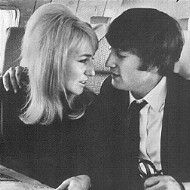 John was no where in sight, and since Yoko didn't bother bringing an overnight bag, Yoko got out of bed and went to John and Cynthia's room and found a bathrobe of Cynthia's behind the closet door and wrapped it around her naked body. She went downstairs and found her way to the kitchen, where she found John drinking a cup of tea, facing her, sitting at the kitchen table. "Good morning," he chimed, with a smile on his face. "Good morning," she said, going over to where he was and kissed him passionately on the lips, "I had a wonderful time," she purred. "Me too," he said, nuzzling his face in her neck, "help yourself some tea, there's some cups in the cupboard up next to the stove," he instructed. Yoko let go of her embrace from John and went to help herself some tea. She joined him at the table and sat where Pete sat an hour ago. Cynthia put her bags into the taxi at the airport with Jenny and Alex. They were happy, joyfully talking about their adventure in Greece and Italy, gushing about the items that they had bought. Cynthia thought that it would be great to drag John to have dinner with them in London. Cynthia was excited to see John and Julian again. She had missed them dreadfully, yet she felt so refreshed and new, she really needed that holiday. A couple of minutes later, the taxi arrived in front of Cynthia's home in Weybridge. When she got out, she realized that the blinds are unusually closed and the porch light was still on. She thought that perhaps John had an all-nighter. The driver took out Cynthia's bags for her and followed Cynthia, Jenny, and Alex into Cynthia's home. The front door was unlocked. Cynthia still thought that John must have been drinking all night and forgot to lock the door. The driver settled Cynthia's bags down and Cynthia gave him his fare and tip for his generous service. The driver left and went into the car to wait for Jenny and Alex. "John? Julian? I'm home!" called Cynthia, waiting for a response. No sight of Julian running down the stairs and into Cynthia's arms. Julian must be at Dot's then, she thought. "John? John?" called Cynthia, walking around the den, the living room, the dining room. "John?" Cynthia left the dining room and went into the kitchen and stopped cold. Jenny and Alex were behind her and stopped cold as well. In front of them, John was facing them, in his robe, drinking another cup of coffee. With her back facing them, Yoko sat still. John looked up and saw his wife standing at the kitchen's doorway. He did expect her to be home, but he expected her to be home later. Obviously, he didn't want his wife to be there. "Oh, hi," replied John, hoping that Cynthia would go away. "Oh, hi yourself," said Cynthia, she thought that it would be wise to continue and took a deep breath, "Jenny, Alex, and I thought that it would be a blast for you to join us for dinner in London, would you like to join us?" "Okay, well, bye," said Cynthia, trying to stay cool and calm. After she left the dining room, she bolted upstairs to get some more items to get out of her house. Jenny and Alex figured that Cynthia wanted to leave, so they took her bags and headed back out to the taxi. "Mrs. Lennon said that she changed her mind, she's coming to stay with us," Jenny explained to the driver. Cynthia came out, running to the taxi and threw her things in the trunk. After she got into the car, they drove off to Jenny and Alex's apartment in London. She needed time to think about what just happened.